The monastic complex at Geghard, 8.6 miles east of Yerevan, was partially built into the rock of a cliff. The current name of the monastery, Gheghardavank, means the Monastery of the Holy Lance and refers to one of the spears said to have pierced the body of Christ. 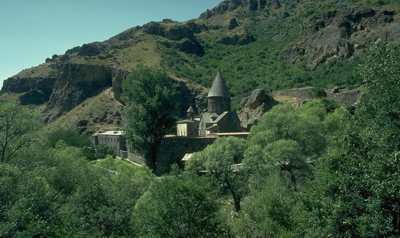 Geghard monastery stands in a deep, heavily wooded valley and is a fantastic example of medieval Armenian architecture. Begun in 4th century AD it consists of the 'Mother of God' Cathedral and two chapels carved deep into the rock.